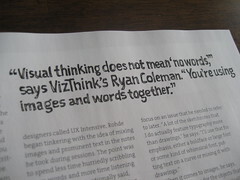 A few months ago myself, Sunni Brown (VizThink Austin) and Mike Rohde (VizThink Milwaukee) were interviewed for an article on visual thinking called “Are you a visual thinker?“. It ran in Associations Now Magazine, a publication of the American Society of Association Executives & The Center for for Association Leadership. At the time I thought it would just be a little piece in one of the back pages of the magazine but it turns out they had bigger plans and ran it as the cover story. In fact, they went the extra step further and hired Mike Rohde to design the cover and provide illustrations for the article. The end result was a fantastic looking piece that exposed the idea of visual thinking to a whole new audience. Mike did a great write-up over on his blog about his process in creating the illustrations which is worth a read. Of course if you truly want to learn from the masters, both Sunni & Mike (along with Austin Kleon) recently recorded a, very well received, VizThinkU workshop with VizThink called Visual Note-taking 101 where they share their secrets and advice for producing excellent visual notes. I have to admit too that I was pretty stoked to get my first block quote in an article. Having it hand drawn by someone I’d call a friend makes it that much sweeter. Overall the article turned out far better than I ever imagined – be sure to give it a read, as well as Mike’s blog post & the VizThinkU session. 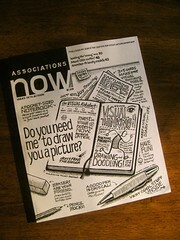 Thanks to Associations Now and especially Mark Athitakis, who penned the article. Over a VizThink we’re launching a new series of online, educational workshops & webinars. Dubbed “VizThinkU” we’ll be pulling in the best content and facilitators our community has to offer and presenting it in regular sessions, in a variety of formats. Ever since Leonardo put pen to paper, visual note-taking has been a route to improve the quality of your thinking, make information more memorable, and make your ideas easier to share with others. Learn practical techniques and “tricks of the trade” from modern visual note-taking masters Mike Rohde, Sunni Brown and Austin Kleon. 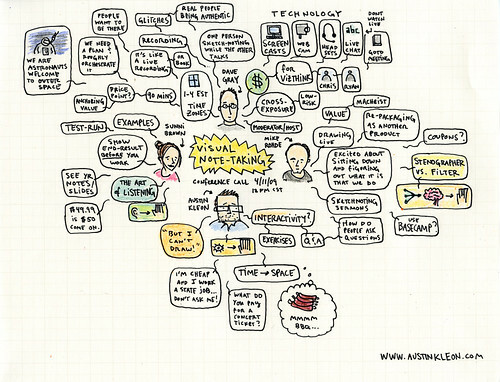 In this three-hour course you will learn how to use visual note-taking to improve your listening skills and take better, more memorable notes. The focus of this class will be on how to write, sketch, and diagram ideas live, in real time, as you hear them. Many of the techniques you will learn will also help to improve your skills in drawing your ideas at the flip chart or whiteboard. Austin Kleon is a writer who draws. A collection of his Newspaper Blackout Poems is forthcoming from HarperCollins in February 2010. He’s drawn cartoons for clients such as Austin City Limits and South by Southwest. He works a day job designing websites, and lives in Austin, Texas, with his wife Meghan. You can see his work online at www.austinkleon.com. significantly enhances meaning, comprehension and memory. Sunni was trained in graphic facilitation at The Grove Consultants International, a San Francisco based company that pioneered the use of visuals in meetings and group processes. Sunni is currently an Associate of The Grove and an Associate of Momentum Leadership, a change management consultancy. She is also co-Founder of VizThink Austin, currently the largest visual thinking community in the United States. She holds Bachelor’s degrees in Journalism and Linguistics and a Master’s in Public Affairs from the Lyndon Baines Johnson School of Public Affairs. She lives in Austin, TX. Mike Rohde is a designer and art director with a passion for simple, effective and usable design solutions. He has over 20 years experience as a professional designer, working in print design, logo and identity design, application icon design, web and user interface design. Mike has been hired by conference organizers such as SXSW Interactive, An Event Apart and SEED, to capture live, real-time sketchnotes of events using only a gel pen and Moleskine sketchbook. He lives and works in Milwaukee, Wisconsin and is a member of the 9rules network, founder of the Palm Tipsheet e-newsletter and founding member of the Milwaukee tech community group Web414. Mike’s work can be found at rohdesign.com and on Flickr . the instructors. You will also have the satisfaction of knowing that your money will go to support the VizThink staff and community.